Decorative Life: About 10 days. Member of the Lamiaceae or Labiatae (mint family). Native to the Mediterranean region, mostly Pyrennees and northern Spain. Common relatives include sage, coleus, rosemary, thyme, oregano and the various mints. Has small flowers in dense clusters at stem ends. Stems are 16-20 inches long, may include some leaves. Plant is a semi-woody perennial, classed as a dicotyledon. Leaves and flowers are sweet, aromatic; used in soaps and perfumes. Can be stored at 36-41 F for up to 3 days dry or 1 week in water, storage lessens fragrance. 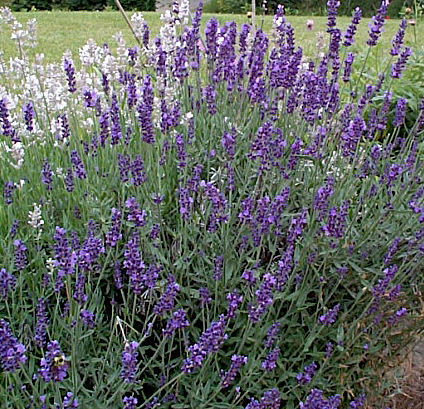 Appropriately named for the Latin word “lavare” or “lavo”, which mean “to wash,” Lavender has been used since ancient times to make perfumes and scent soaps. Some pronounce this genus la-van-DEW-la. Species include L. angustifolia (English lavender), L. dentata (French lavender), L. stoechas (Spanish lavender). All family members exhibit unique square stems. Bees love the flowers. Flowers used to flavor jams, make antiseptic tonic water for sensitive skin, make tea to soothe headaches and calm nerves. Suitable for drying, retains fragrance. Many family members are important for volatile oils used in the perfume industry. Long known for its calming effects, it was written that lavender will “comfort the brayne very well.” According to Creasy (1999), fresh petals are edible. Can be used in jellies, sorbets and syrups. Using ‘Munstead’, Whitman et al. (1996) showed that using propagation stock with 11 or more nodes, a minimum storage of 10 weeks at 41F and forcing at 68F with a 4 hour night interrupted light period produced the best plants in about 7 weeks.